Have you ever felt that there’s too much a demand on your time? That people need you more than you can be available? That you couldn’t possibly train someone to take over for you? 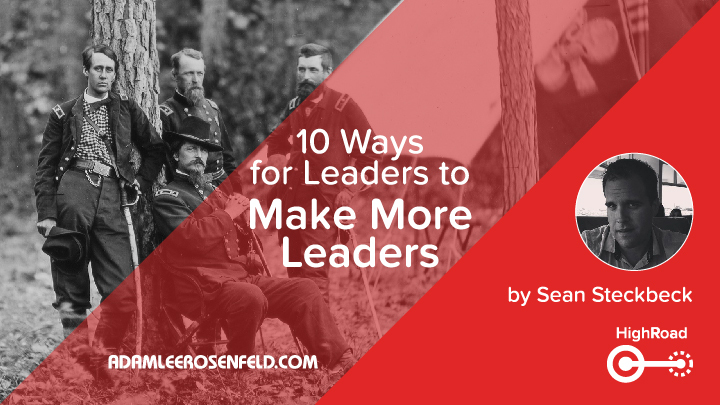 Sean Steckbeck is a leader who’s an expert in making more leaders. He’s been raising up leaders all over the Middle East and the Far East. And he’s going to teach you today about being a reproducible leader. And one more thing – Sean’s a hero of mine. He’s a hero because he embraces his natural identity, his national identity, and his spiritual identity. And these are all part of the Second Stage of Definition that I outline in my life strategy blueprint, “HighRoad”. Want to know more about HighRoad? Get my free ebook here. There is much to be said for the noble truth that true leaders are actually servants, but how does that look like in reality? What are some of the nitty gritty “on the ground” principles that help us identify and recognize a servant-leader? There are many practical qualifications that I use when trying to identify such a leader. One of those qualifications is multiplication. A vision for multiplication tells me a lot about the character of a leader. I believe it could define every other quality. I remember the September evening well from ten years ago, I had planted our first home fellowship and the majority were new believers. One by one, the excited members of our home fellowship would bring eager seekers who needed healing, and would ask me to pray for them. I had always encouraged them that they can do whatever I can do. I prided myself in regularly encouraging them that they could have their own ministries. But this time, their words hit my heart like an arrow. I realized that no matter how much I had encouraged them that they could do the same ministry I was doing with them, I was not a reproducible leader. They were looking up to me still as the professional that they needed rather than as an example to be followed. This took me on a journey to discover how to become a more reproducible leader. There is a need in each of us to be wanted, to be desired, to be needed, and to be celebrated. Eventually, we must come to terms with the fact that only in Yeshua [Hebrew for “Jesus”] we are desired, needed, and celebrated. We have to hear those words from His mouth before we can become adequate reproducible leaders. The criticism of men don’t affect me, because the praise of men don’t affect me. This must be our attitude if we want to become reproducible leaders. We have to nearly die to our need to be recognized. Asks the question: “Can the simplest person in the room do what I am doing?” Then practices simple and reproducible models of leading. Prays for those he influences and leads on a regular basis. Comes up with a regular plan for skill development and assessments. Celebrates accomplishments and encourages regularly. Practices leading people to the leadership of Jesus rather than pointing at their own leadership. Is able to celebrate when people go beyond his own skills and does not feel threatened. Leads to a pre-emptive strike against division, by creating a culture where splits are encouraged rather than looked down upon. Creates an atmosphere where ownership and coerced loyalty with hierarchal structures do not exist. Does not get offended if the people they are coaching need other coaches with skills they don’t have to offer. Knows that He is growing the kingdom of God more than his own ministry and acts accordingly. I hope this list is just the beginning of how we as leaders can go test our hearts and actions on becoming more of a reproducible leader. Where the joy of our work does not come through how many followers we have, but how many leaders we have released. Sean and Ayelet Steckbeck are the founders of Simeon’s Cry Ministries, a ministry that is committed to the salvation of Israel. Sean is also a co-founder of Global Catalytic Network, an organization that helps catalyze leaders all over the world through the multiplication of micro-church movements. Sean and his wife live in the Negev desert of Israel and raise their three children by the grace of God. Connect with Sean here.